Comfortable, stylish, simple. I love it! Nice sweatshirt!I want to it!! Agreed – I love this trend. I live in grey sweatshirts – ultimate comfort! I really LOVE it!!!!!!!! these tow style are perfect for me, simple and conformable outfits!!! not a fan… most things I can appreciate in some aspect, but I just don’t get these looks. Sweat-shirt chic… love that so much! Love the shade of gray on her sweat shirt that echoes the stone sidewalk! Absolutely fabulous layered with the lace… don’t know how I feel about the sneakers, though. but that mostly just proves that a year and a half after purchase and it’s still going strong. So yes, my point is, sweatshirt chic is very chic! The pic on th right is full of style! Love the combo sweatshirt +lace skirt! I really like the lace. Looks great. Love, love, love the second one. That lace and those shoes..just quirky. 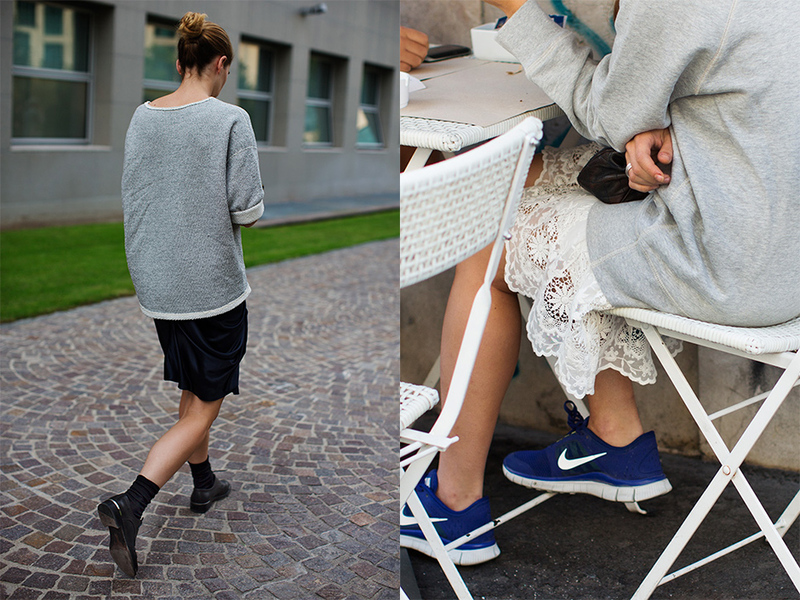 “Sneakers & sweatshirt & lace. Oh, my!” Dorothy would definitely approve. I don’t know, though, about the Wicked Witch. Unless, the outfit was black, and accessorized with a broom. Sweatshirt chic- teamed with a black leather biker jacket, perfect rough luxe!! A combination of both photos, may be. Gosh! This must be a very young lady! Just to get away with this look! Sorry to say but this is an awful wardrobe combination!!! The one on the left is my favorite! absolutely love this style!! comfort chic = amazing! My new favorite items are cashmere sweatshirts! Love how the first girl wore it over that drapey skirt! Sweatshirt, lace and trainers. What more could you ask for?! Love this look! Been on the lookout for a simple oversized sweatshirt for a while. This gives me renewed inspiration! Thanks! A sweater like this gives you a sports-luxe look really cool! I love sweatshirts! They feel so soft inside, and warm. Definitely will be wearing them this winter. Sweatpants too. I am tired of wearing regular pants in winter and having cold legs. The fashion is smashin’ but I am all for functional, and warm. Tough, athletic and chic! love it!